It’s about that time again…Sugar Block time! 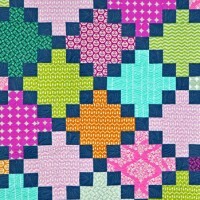 February is upon us, and it’s time to dig through your stash, pick out a yummy combination, and stitch up a new block! Lots of announcements today so be sure to read through the whole post! Last month was all about Churn Dash, and this month we’ll be playing with another age-old classic- the Log Cabin. 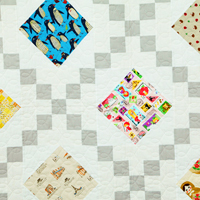 Log cabin style patchwork is one of the most popular and easily recognizable quilt patterns in the world, dating back to at least the 1860s in America, to the mid-1700s in Great Britain, and if you can believe it, even back to ancient Egypt. Read a fascinating article about the history of the log cabin pattern here, and don’t miss the fascinating account of the “mummy theory”. Log cabin designs on ancient pet mummies? You have to see it to believe it. There are countless variations of this traditional block, but most consist of a center shape- usually a square- with strips sewn in sequence around the edges, building the block like, well, a log cabin- strip by strip, log by log. Different design patterns can be achieved by playing with the color and light/dark value of the strips. Our Sugar Block this month is comprised of four log cabin sections, with a half square triangle as the starting point for each section. 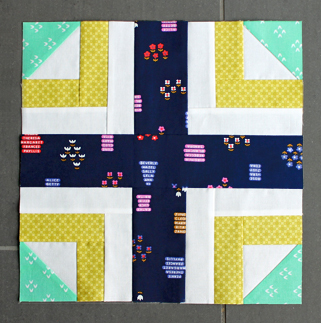 The four sections are then joined with a contrasting “sashing” that adds a bold center cross motif to the block. Our section starting points- those half square triangles that start off the building of our blocks- end up in the corners. The result, I hope, is a simplified and modern feeling block that pages homage to this old classic, but manages to look entirely new and fresh. Let’s get going on this block! 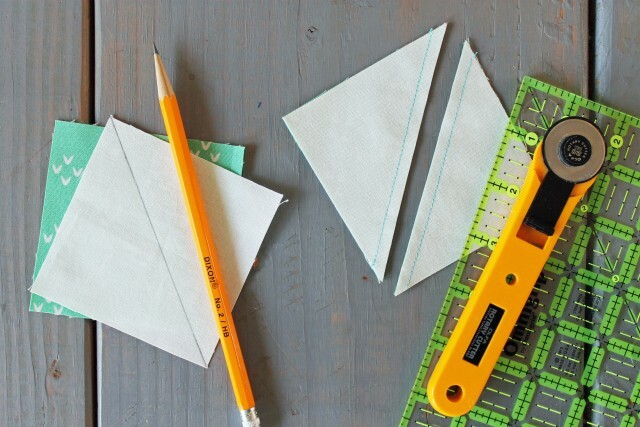 To construct the half square triangle units in the corners, draw a diagonal line from corner to corner on the wrong side of both white squares. 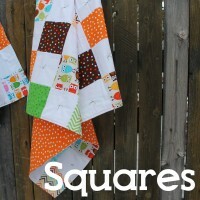 Pair each white square with a green square, right sides together, and stitch 1/4″ seam on both sides of the drawn line. 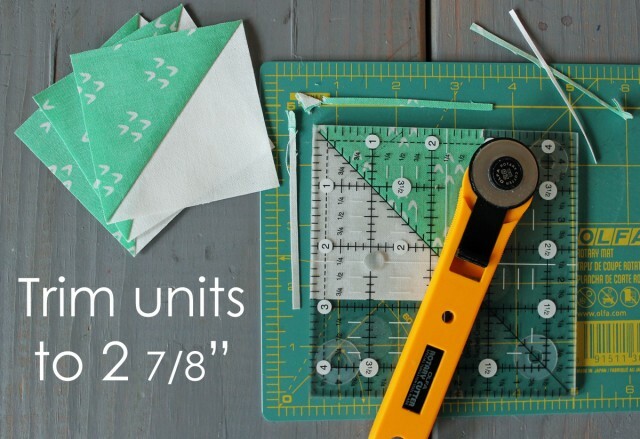 Cut units in half on the drawn line (creating a total of 4 units). Press open. 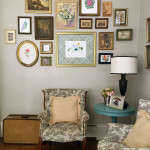 Trim half square triangle units to 2 7/8” square. 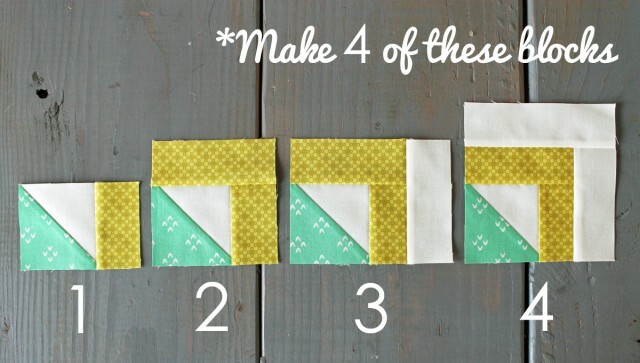 Stitch the yellow and white rectangles to the white sides of the half square triangle, pressing after each seam. To assemble the block, stitch the log cabin units into two rows of two blocks each, with the vertical sashing between the blocks and the half square triangles pointing outward. Press toward sashing. Stitch rows to both sides of the horizontal sashing strip and press toward the sashing. 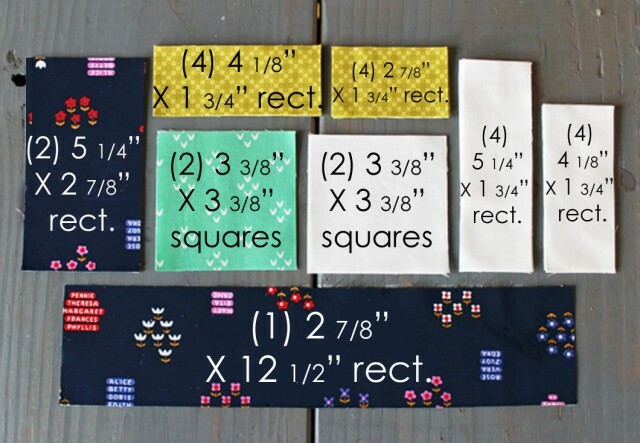 Square to 12 ½” as needed. 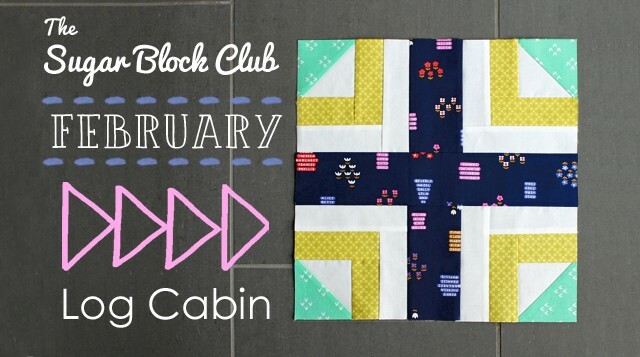 This month’s quilt is designed around a variation of our log cabin block. 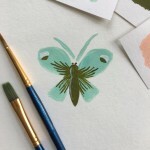 The design reminds me of my beloved childhood craft, cross-stitch, so I named it after the open weave fabric used for cross-stitching- Aida cloth. 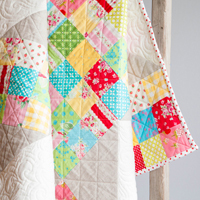 The Aida quilt is drenched in vintage charm! So excited to be stitching this up! This brand new pattern will be available in my shop this week, and I’ll be sure to send you members the link in an upcoming email. 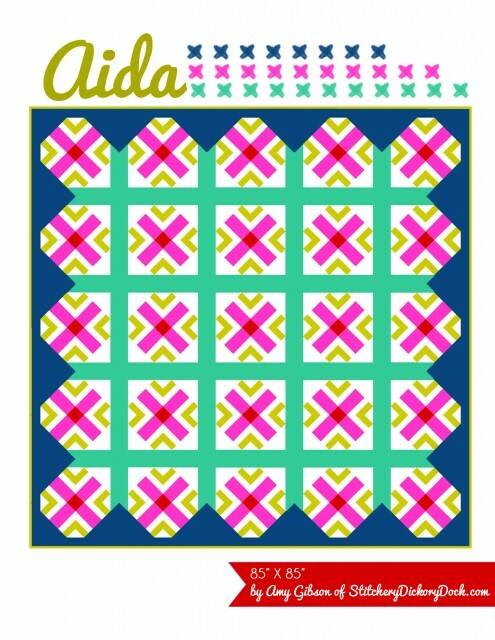 The pattern will be purchasable on it’s own, or you can upgrade to a premium club membership and receive all 12 of this year’s quilt patterns automatically, along with a ton of other fabulous perks! This is an exciting new feature this year that I hope you enjoy! 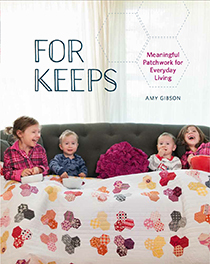 All of those perks- 12 quilt patterns, 12 block PDFs, a super cute SBC quilt label for your finished sampler, entry in all of this year’s exclusive premium swag giveaways, and 50% off of any of my Craftsy classes- all for just a flat $19.95. 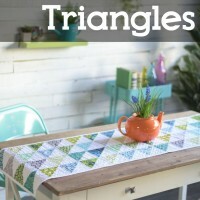 You’ll receive your January and February pattern downloads today. 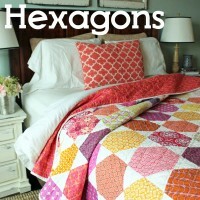 All future patterns will be emailed to you as they are released throughout the year. Last but not least- January’s giveaway! 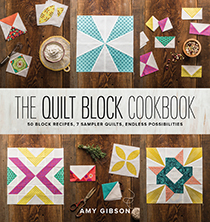 I opened it up to everyone this past month, for a chance to win my Blogger’s Choice bundle from Fat Quarter Shop, and a copy of Sister Sampler Quilts– a new book out by AnneMarie Chany. A huge congrats to Dawn Jones!!! Dawn, you were comment #306, and the winner of this month’s fabulous giveaway! And that’s a wrap for the February SBC! 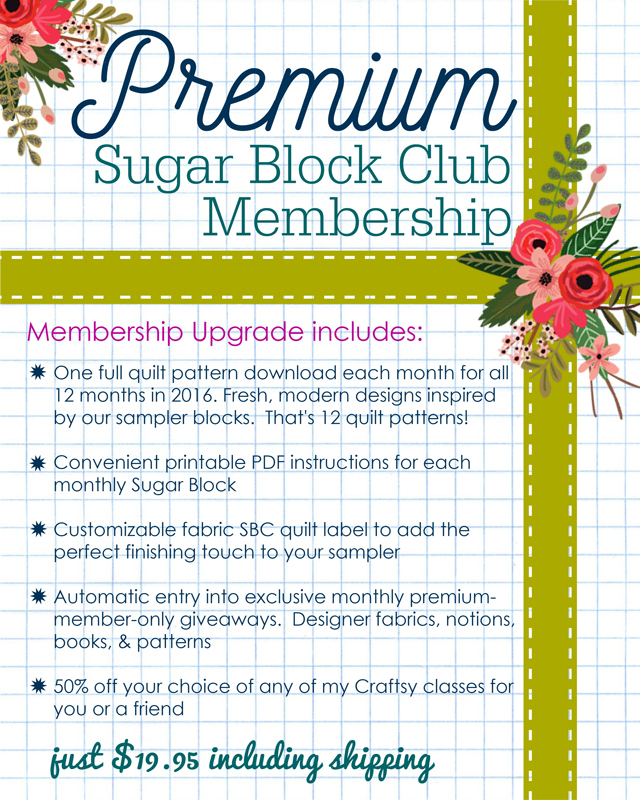 Get stitching up your blocks, and don’t forget to post and tag them on social media using the hashtag #sugarblockclub. another fabulous block Amy – really love Aida ! congratulations to Dawn Jones on winning your bloggers choice – its an awesome bundle and I would have been happy to have another one in my stash !! Thank you Leanne! I’m so glad you like this month’s designs!! Great block!!! I love the feel of cross-stitch on the big quilt, probably because I still enjoy this craft too! I like this block! It is a fun, modern twist. ~ And the cross motif at the center gives Aida a beautiful nod to cross stitching. Love it! Thank you, Amy. Congratulations to Dawn. great block I can already see it with my fabrics! Yay! Be sure to post a picture on Instagram! 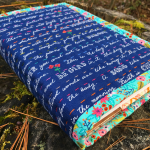 I started with you on Craftsy BOM and still love all your designs, fabric/color choices, SBC and especially love your new blog design–love the flowers; it fits you. Thank you so much Linda!! I appreciate the kind words! I love the new blog look too! :) Feels like me! Where can I post the block, please bear in mind I’m terrible at computers! 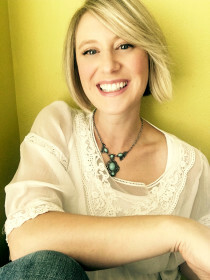 Dear Amy, You are the nicest person and an excellent teacher. 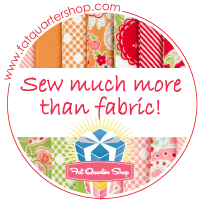 Even though I’m an experienced quilter and teacher myself, I love your Craftsy classes because of your skills and equally so, your sweet personality and presentation. It is so relaxing and comforting to have you on the computer. I love your two new Sugar Block Club blocks. You have succeeded in making a dear traditional block come to life in our modern movement. They are really amazing. I can’t wait to see what you have designed for the rest of the year. I am signing up for the Premium SBC Membership right away. What a great offer! Thank you for working so hard to develop the gifts you have been born with and sharing your skills and talent with the rest of us! When I made the block, I found that the longer white strip was 1/8 inch too short. What I did was cut the log cabin unit to 5.25 inch square. 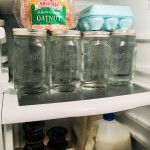 This means that the white strips end up 1/8 of an inch narrower. I cut the strips for the cross 3 inches wide so the block ends up the right size. I had some sizing issues at the end, too. I’m waiting to see if there will be a correction posted, or if I was careless with cutting or piecing at some point. I will need to do some unsewing and redo the light strips. Thanks for your response, Amy! I decided to cut those last long light strips a tad long, and then carefully square up the block to 5 1/4″ before adding the dark center strips. Everything lines ups much better now. I’m loving the my first two blocks! I guess I should join instagram. Thank you again! I definitely found the same problem with the last white strip and just stopped and waited to know what everyone else was doing. I’m sort of a beginner so reading these replies is so helpful. 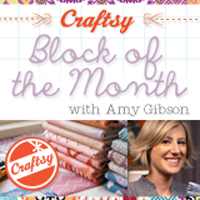 This site and these blocks of the month are fantastic and exactly what I needed to push my skills. Thank you for creating it. You definitely have a new fan. This is a great block to match January. This is a great block, thank you for the tutorial. And thank you for the giveaway, I’m so excited! Another great tutorial! I love your modern take on both traditional blocks, churn dash and log cabin. Great designs! Is there a way to follow you on Instagram or do we just have to depend on checking and using the hashtag? 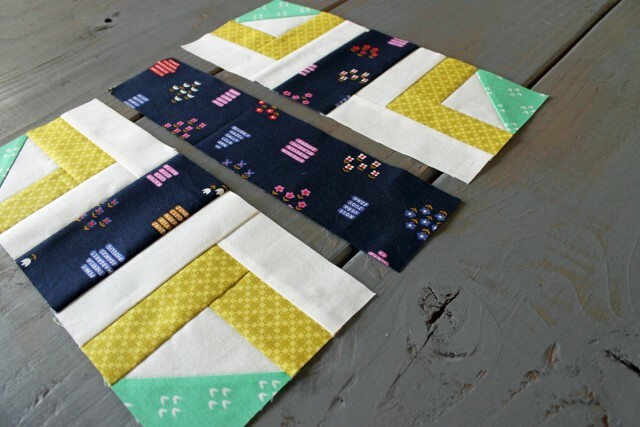 Loving this new block and it’s just in time for my guilds monthly sew day! Thanks for making another lovely block! I encountered problems with the long white pieces and the short navy pieces also. I ended up re-cutting those pieces to 5. 375 inches length and they fit nicely, then ended up squaring the block to 12.5 inches as it was a smidgen over 12.5 so I guess you could say I gave and then took it back! Funny how that worked out! I love the look of the block. Amy, maybe you could warn us, mention it?, that this problem exists if it occurs down the line. Thanks! Last night was our monthly meeting for ABQ MQG. We had a challenge to sew along with your monthly block and about half our members joined in. Lots of people brought them last night, Feb. 2, but a few brought both Jan. and Feb. block. It is interesting to see all the different blocks, and they look so great. thanks for the monthly sew along blocks. Thoroughly enjoying this quilt along. You are a fantastic teacher. Bet your children love being home schooled. Amy, I’m so excited to do these blocks with you. 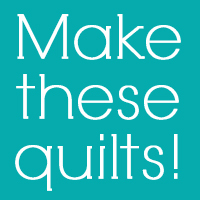 I had started quilting several years ago (my sister & I) teaching ourself. Well I had things that took over in my life and couldn’t find my way back. Well I seen the free BOM you did on Crafty and I signed up . Well you did it for me and I got back to sewing again. If it had been another teacher I don’t think I would have done it. You have a wait about you that makes everything alright. I know you have your hands full with your beautiful kids and I know twins can be a hand ful because I had twins yrs. ago. But thank you for what you do for us. I’m going to try to do this one with you this year. I just can’t find a way to get them to print out. So if you could help me, thank you in advance. Also for last months also. I love your blocks and tutorials. Thank you for being you! thank you for the Sugar Block Club blocks. I enjoy trying new blocks! I am done with block number two. I think it turned out pretty well. Did we post pics here last month? I don’t do Facebook or Twitter. of. I say to you, I definitely gget annoyed whilst people considr issues that they just do not knlw about.